It is no wonder that the UK is seen throughout the world as a soft touch and safe haven for no good Islamists and terrorists to claim asylum when the British government publishes guidelines for asylum claims such as the one for members of the Muslim Brotherhood(Aug 2016). Even post Brexit the lunacy continues. 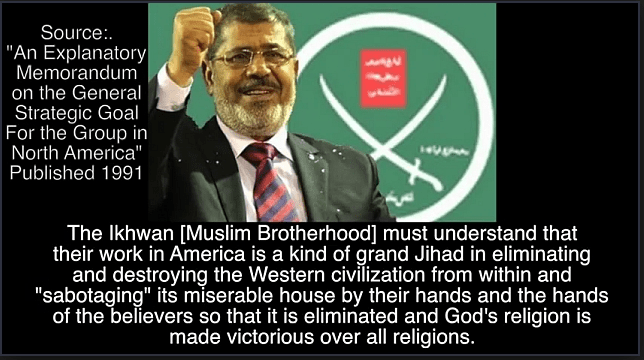 The Muslim Brotherhood were behind the Egypts ‘Arab Spring’ in 2011 which saw Islamists seize power with Muslim Brotherhood frontman Mohammed Morsi elected president. The Islamist group remained in power until 2013 when the military ousted them. MB has since been labelled a terrorist organisation by the governments of Bahrain,* Egypt,* Russia,* Saudi Arabia,* Syria,* and the United Arab Emirates. The Muslim Brotherhood is a transnational Sunni Islamist movement that seeks to implement sharia (Islamic law) under a global caliphate. The group operates through both violent and political means. Founded in Egypt in 1928, the Brotherhood is the country’s oldest Islamist organisation and has branches throughout the world. 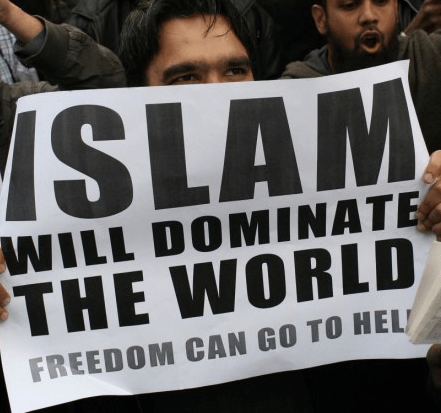 While these branches operate under a variety of names and use a variety of social, political and/or violent methods, they share a commitment to the overarching goal of establishing rule according to sharia. The most notable and lethal Brotherhood offshoot is Hamas, the Palestinian terror group operating out of the Gaza Strip. .
Egyptian members of the Muslim Brotherhood may be able to seek asylum in the UK, according to new guidance from British immigration authorities. But the move could anger London’s allies in the Middle East – including Egypt and Saudi Arabia – which have declared the Brotherhood a “terrorist” organisation. It also adds that the group “are reported to have released a statement in January 2015 calling on followers to embrace ‘jihad’ and ‘martyrdom’ to fight the current regime” in Egypt. During the past two years the UK government has sent mixed messages about the Brotherhood. In December 2015, then prime minister David Cameron said in a written statement that while the country would not ban the group, it had a “highly ambiguous relationship with violent extremism” and was “deliberately opaque”. Cameron’s comments came at the same time as the publication of an of an 11-page summary of a review, which has been repeatedly delayed and has yet to be released in full. The Jenkins review did not find direct links between the UK Brotherhood and radical Islam, but said that membership could be considered a “possible indicator of extremism” and that the group had been a “rite of passage” to violence for some members. 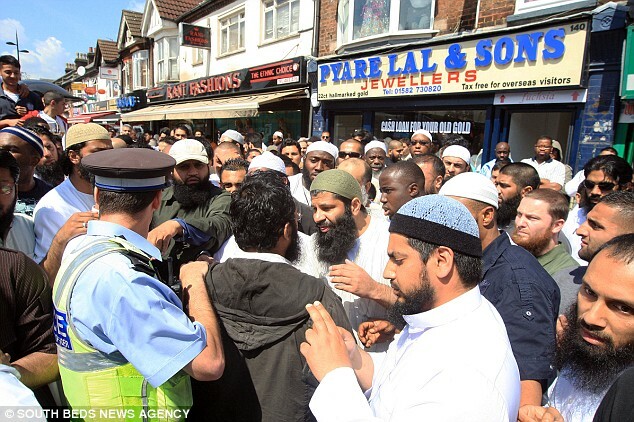 As a result, it said, the group would be closely monitored to ensure it was not breaking UK anti-terrorism laws. UK allies in Middle East: Putting pressure on London? The Jenkins report was commissioned in 2013 as Britain came under pressure from the UAE, Egypt and Saudi Arabia to ban the Brotherhood, which had been proscribed as terrorist in all three countries following the removal of Brotherhood member Mohamed Morsi from the Egyptian presidency. Critics of the report have accused Britain of conducting the investigation under pressure from Gulf allies. That concern was heightened last November when reports emerged of documents revealing that the UAE had threatened to cut lucrative arms deals with the UK, stop inward investment and cut intelligence cooperation if Cameron did not act against the group. British ministers delayed its publication on two occasions, leading to allegations that the results would upset British allies in the Middle East. The final report remains unpublished. In June foreign policy experts told the UK parliament’s foreign affairs committee that the report overemphasised the group’s connection to violence and was at times inaccurate. Courtney Freer, a research officer at the London School of Economic’s Kuwait Programme, said the Jenkin’s review “overplayed the connection between the Brotherhood and violence and violent groups”. The Brotherhood, which was founded in Egypt in 1928 but now has branches in many states, many of which have little connection between one another, has repeatedly denied that it has engaged in or promoted acts of violence. 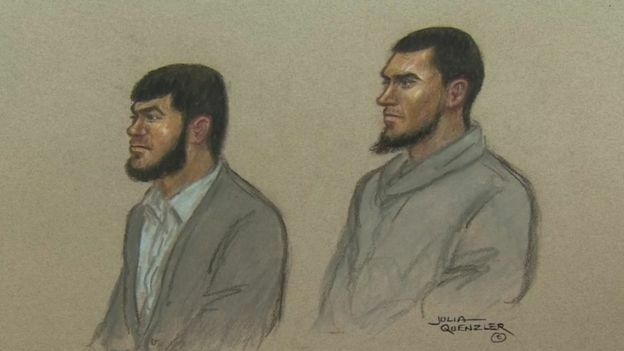 LONDON—A British couple who plotted Islamic State-inspired suicide bomb attacks against targets including a popular London shopping mall and the city’s subway system were both handed life sentences on Wednesday. Mohammed Rehman, 25, will spend at least 27 years behind bars, while his wife, Sana Ahmed Khan, 24, will serve a minimum of 25 years in prison, judge Jeremy Baker ruled in a short hearing at the Old Bailey. 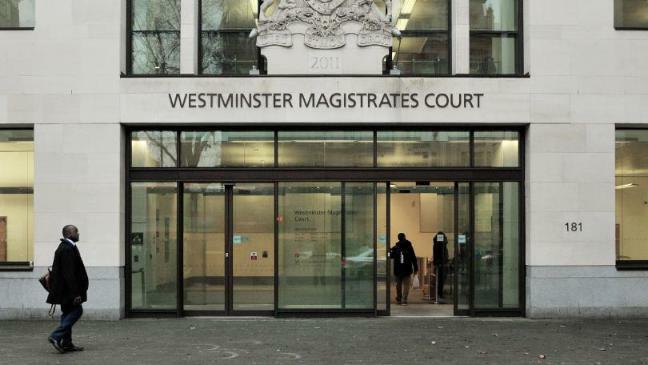 Mr. Rehman, from Reading, west of London, and Ms. Ahmed Khan, from the nearby town of Wokingham, were Tuesday convicted of preparing terrorist acts. Mr. Rehman was also convicted of an additional charge of possessing an article for terrorist purposes. The couple assiduously set about constructing explosives capable of causing mass casualties and were on the brink of executing their plans when specialist counterterrorism police arrested them in late May, police and prosecutors said. Prosecutors said Mr. Rehman and Ms. Ahmed Khan intended to time their attacks to coincide with the 10th anniversary of the July 7, 2005, suicide bombings on the London transportation system that killed 52 people and injured hundreds more. 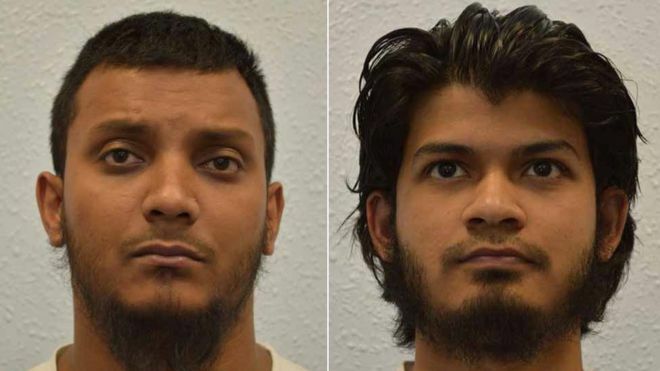 “The pair had been very close to carrying out an attack, all they required was to purchase the chemicals to make a detonator,” said Susan Hemming, head of the Crown Prosecution Service’s counterterrorism division after the guilty verdicts were delivered on Tuesday. The husband and wife, who married in secret in 2013 and lived separately, had been under surveillance after police noticed a series of social-media posts by Mr. Rehman that made clear his intention to carry out violence in the name of radical Islam. 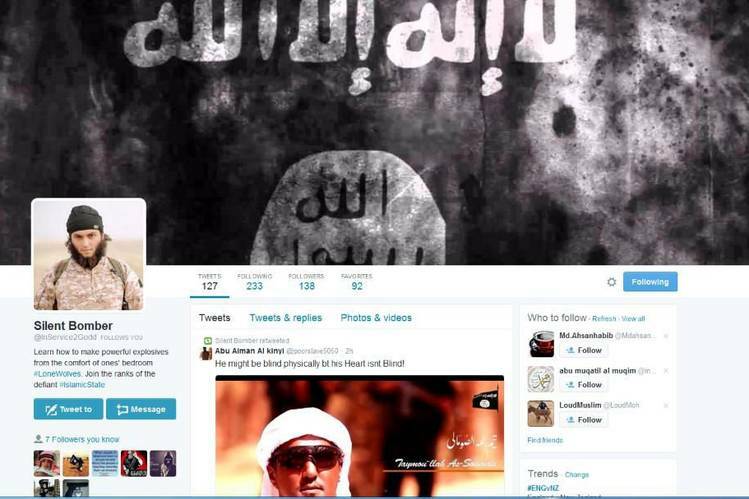 Using theTwitter alias “Silent Bomber” in an account featuring images of Islamic State executions, Mr. Rehman called on his Twitter followers to vote on possible targets in the capital. Mr. Rehman stockpiled fertilizer and carried out minor test blasts in his garden, the court heard. Police who raided Mr. Rehman’s Reading home found more than 10 kilograms of highly explosive urea nitrate, which prosecutors said would have caused “multiple fatalities” if detonated in the tight confines of a subway train or station. 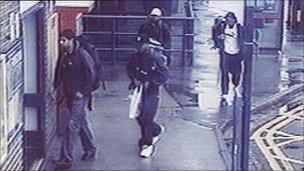 They had also considered bombing the Westfield Shopping Centre, prosecutors said. “There is little doubt that, had Rehman and Ahmed Khan not been stopped when they were, they would have attempted to carry out an act of terrorism in London,” said Ms. Hemming said. 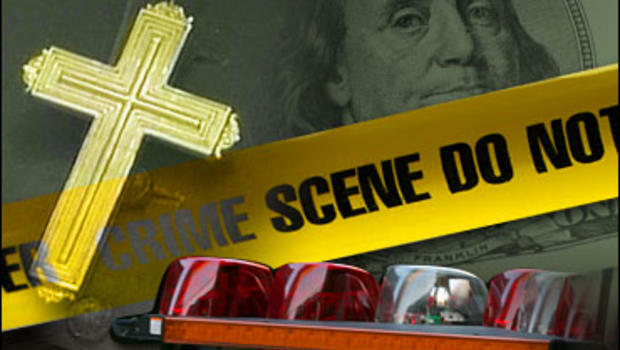 During the six-week trial, jurors heard how Ms. Ahmed Khan helped her husband by taking out loans and depositing nearly $21,000 into his bank account for the purchase of explosive chemicals. Prosecutors said Ms. Ahmed Khan was a “supporter of violent and extreme Islamic ideology” who played a key role motivating her husband. The pair shared Islamic State video clips, which police and prosecutors said was proof of their radicalization and malign intent. The two defendants denied the charges. In an interview with police presented in court as evidence, Mr. Rehman admitted manufacturing explosives but said it wasn’t with the intention of hurting anyone. His wife, Ms. Ahmed Khan, refused to answer questions from police and denied any knowledge of his social media posts. Speaking after the sentencing on Wednesday, the police officer who led the unit that tracked Mr. Rehman and his wife welcomed the court’s decision. “It was clear that Rehman and Khan shared a radical and violent extremist ideology,” saidLaura Nicholson, the head of the South East Counter Terrorism Unit. “They actively accessed extremist material on the Internet and used social media to develop and share their views as they prepared acts of terrorism. The sentences at court here today reflect this and the threat they posed with their actions,” Ms. Nicholson said. Three so called legitimate British Muslim groups : Islamic Relief, Muslim Association of Britain (MAB), Cordoba Foundation, have been included on a list of 85 designated terrorist organizations by the UAE government which also included ISIS, Boko Haraam ,Al-Qaeda and the Muslim brotherhood. Bearing in mind that UAE is a hard line Islamic state who have good knowledge of terrorist goings on in the region,you cant help believe these British based Islamic groups are up to no good. A huge British based Islamic charity which is one of the biggest NGOs in the world. With a mega income of almost £100 million a year. A large chunk of that comes in the way of government funding comes from us in the UK and other Western Governments, the United Nations and the European Union. For a number of years the Israeli Ministry for Foreign Affairs designated IRW itself a terrorist front, IRW appears to be a hub for donations from charities accused of links to Hamas, Al Qaeda and other terror groups. A report by Stand for Peace believes that IRW is an extremist organization with a pro-terror agenda.First, IRW’s accounts reveal that it has partnered with a significant number of organizations that are linked to terrorism. Second, IRW’s trustees are personally connected to extreme Islamist groups with connections to terror. Finally, IRW and some of its subsidiary branches have run events with extremist, anti-Semitic and pro-terror speakers. a lifelong member of the Muslim Brotherhood who was at that time its spokesperson and representative in Europe.In a 2004 statement the MAB said “MAB enjoys good relation with every mainstream Islamic organisation in the UK and abroad among them is Muslim Brotherhood which is well respected “. Their extremist views and belief in political Islam were shown when a newspaper published by the MAB for the September 2002 Stop the War protest suggested that apostasy from Islam could be a ‘religious offence punishable by death,’ and said the MAB shares the Muslim Brotherhood’s goal for ‘the widespread implementation of Islam as a way of life; no longer to be sidelined as merely a religion’. The MAB has organised and promoted events with hate cleric Anwar al-Awlaki at a time when he was wanted for questioning by the FBI, over his involvement with the 9/11 attackers. Another notorious hate cleric they have hosted is Yusuf al-Qaradawi the spiritual leader of the Muslim Brotherhood. The fundamentalist preacher is a supporter of jihad, FGM, wife beating and killing anybody who leaves Islam.An islamofascist if there ever was one. MAB are yet another Islamist group that have links to communists from Socialist Workers Party and their front group, UAF. Heavily involved in the leadership and protests of another SWP front group Stop The War Coalition who openly supported Iraq in the second gulf war against the allied forces. StWC recently protested in London in defence of terrorist ISIS. The Cordoba Foundation are a Muslim think tank which claims to be independent but in truth lobbies on behalf of the Muslim Brotherhood ans other Islamists. It works closely with other British extremist groups which seek the creation of an Islamic dictatorship, or caliphate, in Europe. Its agenda has similarities with that of the Muslim Brotherhood with many experts on Islamic extremism claiming Cordoba is a Muslim Brotherhood front group. Cordoba Foundation, were described by the Prime Minister, David Cameron, as a “political front for the Muslim Brotherhood”. Cordoba leader Anas Al-Tikriti is said to be the UK leader of the islamist Muslim Brotherhood. He is the son of Osama Al-Tikriti, one of the leaders of the Iraqi Islamic Party representing the Muslim Brotherhood in that country. In addition to his role at Cordoba, Al-Tikriti is one of the leaders of the British Muslim Initiative (BMI), part of the U.K. Muslim Brotherhood. The Muslim Association of Britain (MAB) had for many years been the most active organization in the U.K Muslim Brotherhood but many of the leaders of the MAB left in 2007 to form the BMI. The split was said to be caused over involvement with far left politics in particular involvement with the Socialist Workers Party ( Unite Against Fascism) in setting up Stop the War Coalition.